Did I mention what a terrible blogger I am? I’m currently catching up so I can stay on top of the spring pottery events this year. Last April, as per usual, I volunteered to help run the checkout area at the Dallas Pottery Invitational. 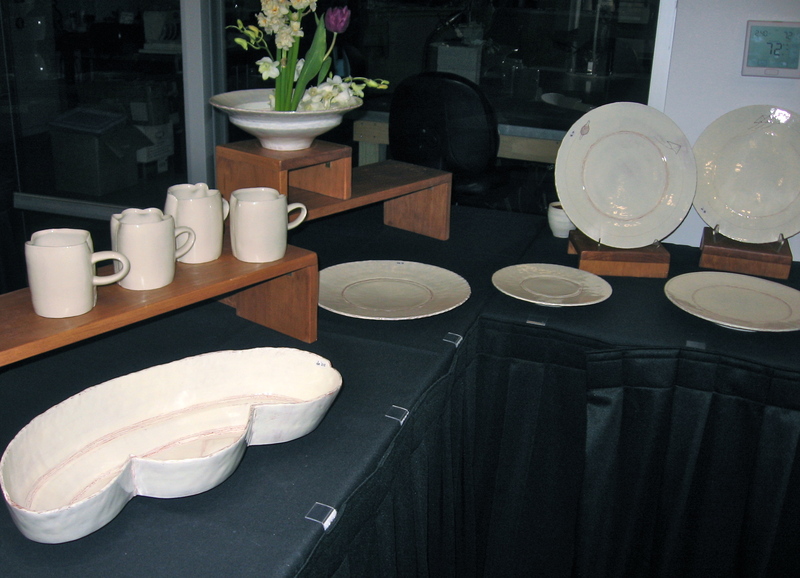 The core group of artists is always interspersed with a fresh group of invited visiting potters. For more info on this year’s invitational: Dallas Pottery Invitational. 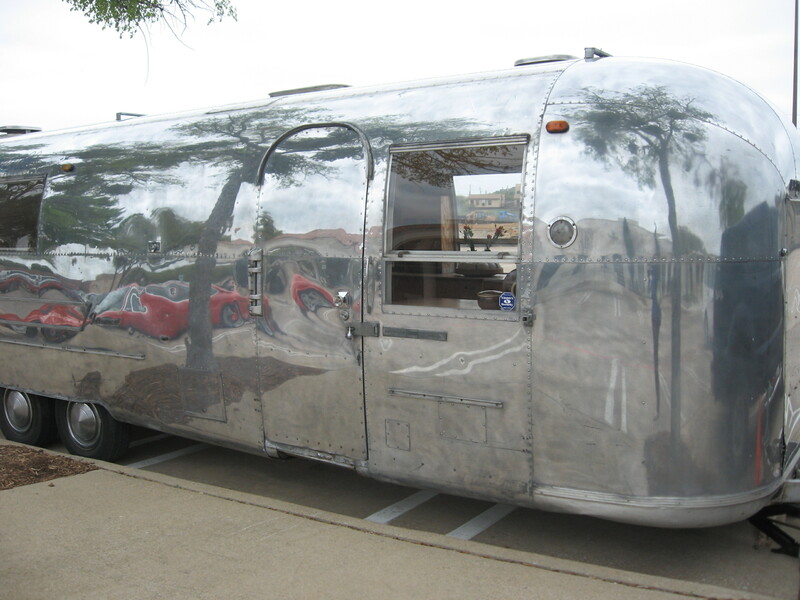 The famous Artstream mobile gallery made it to the 2013 DPI. First on the docket, we have some cheeky pots by Andrew Gilliatt. 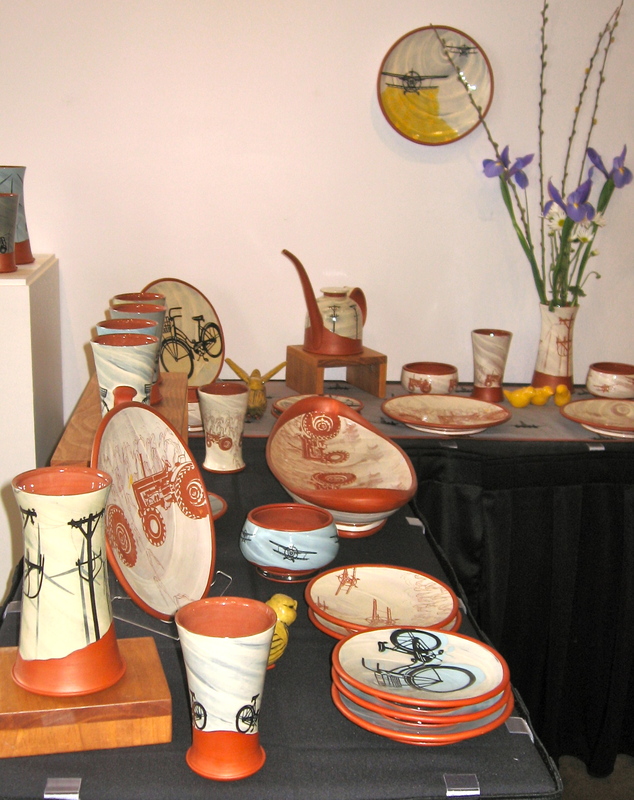 Hailing from Helena, MT and the Archie Bray Foundation, this excellent potter uses technology to his advantage. His slip-cast pots feature strong formal lines with precise glazing and often humorous repeating decals, such as in the case of the hot dog shaped unglazed areas filled with tiny dachshunds. Some of Andrew Gilliatt’s glazed and decal-encrusted ware. They’re all great pieces, but I bought the horse head mug shown in the photo above. Equestriennes FTW! More cheeky pots. Said wiener dogs and wiener shapes appear on the large bowl in the upper right. Next up, please enjoy the work of core group potter Lisa Orr. A self-proclaimed synaesthetic, the glazes reflect a sort of frenetic energy often accompanied by the mixup of concrete concepts and colors in her mind. Slump molds and sprigs forms pots, enhanced with riotous glazes. 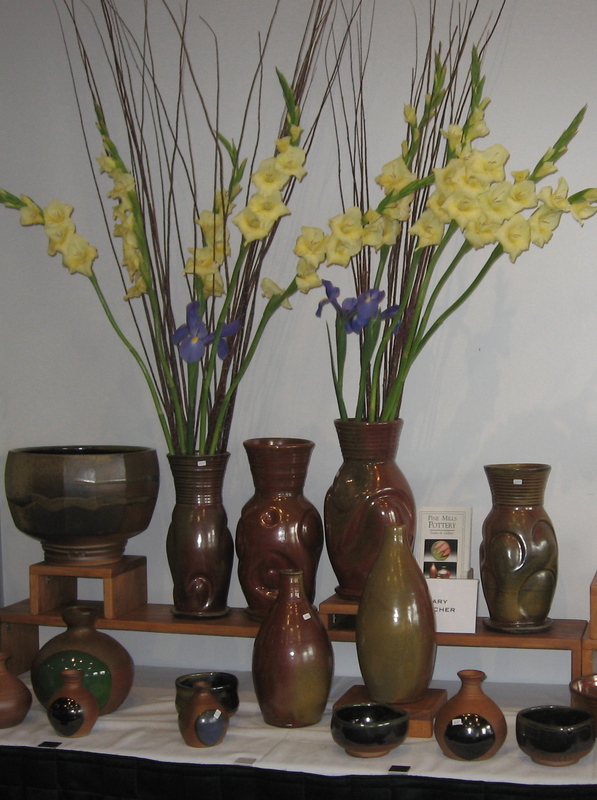 Daphne and Gary Hatcher of Pine Mills Pottery brought a boat-load of pretty pots as usual. Gary’s somehow more masculine ware favors the kind of scale and simplicity commonly associated with a male-friendly aesthetic. Lovely work by half of the Hatcher duo. 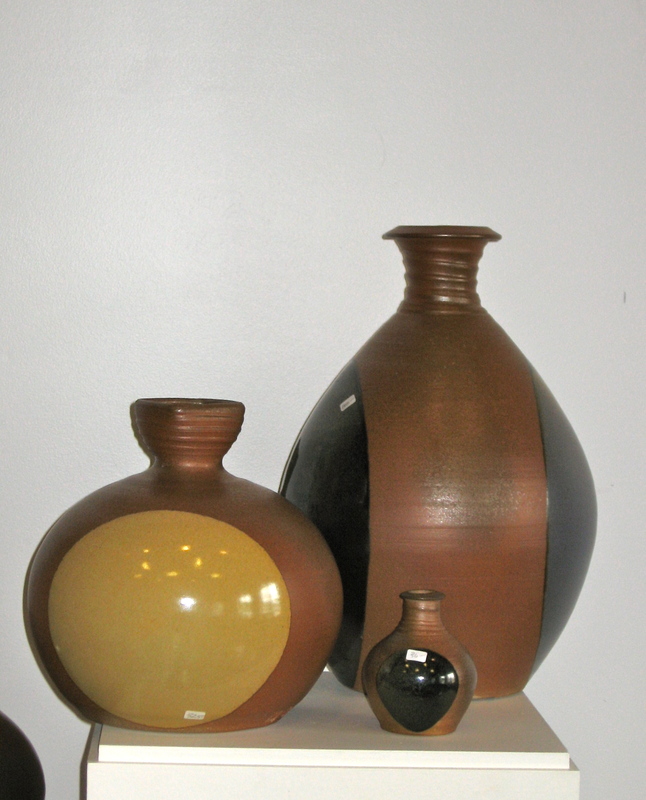 I’m especially crazy about the altered vases with the large swirls, and the giant faceted bowl. A detail of some round-bellied vases. 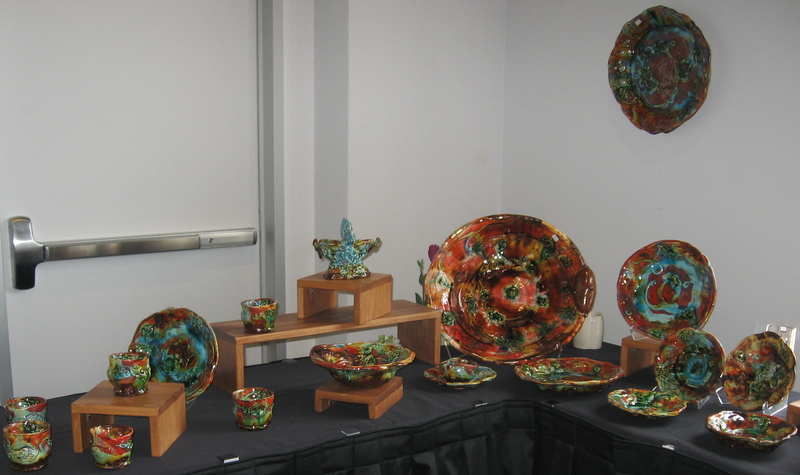 Daphne Hatcher utilizes more complex glazing techniques and different ornamental forms. Her technique of wax-resist glazing copper red on top of a black base was one of my favorite go-to glaze applications in my college days. The floral motif pieces exhibit the afore mentioned copper red/shiny black glaze technique. The pattern variations always attract me to her lively pots. Those quiet little round boxes may still be my favorite form in her repertoire. A colony of adorable boxes among plates and platters. For the wood-firing set I’m pleased to present the work of Liz Lurie. Between sumptuous dark clay bodies, slips, flashy shinos, and earthy forms she finds a magic combination of elements. 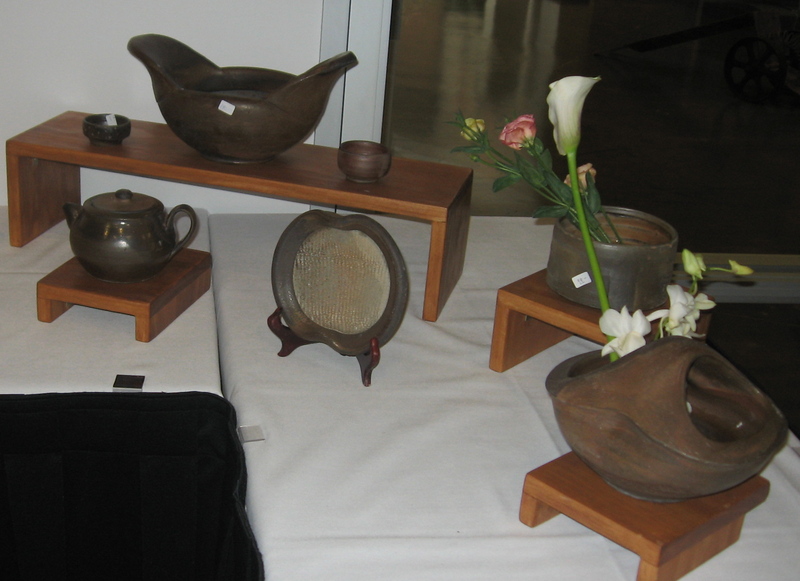 My erstwhile pottery professor’s lovely wife makes incredible wood-fired ware. Employing frogs to secure flowers upright, the baskets always attract my gaze. The bowl with large ear-shaped lugs has a gorgeous form and great visual lift. 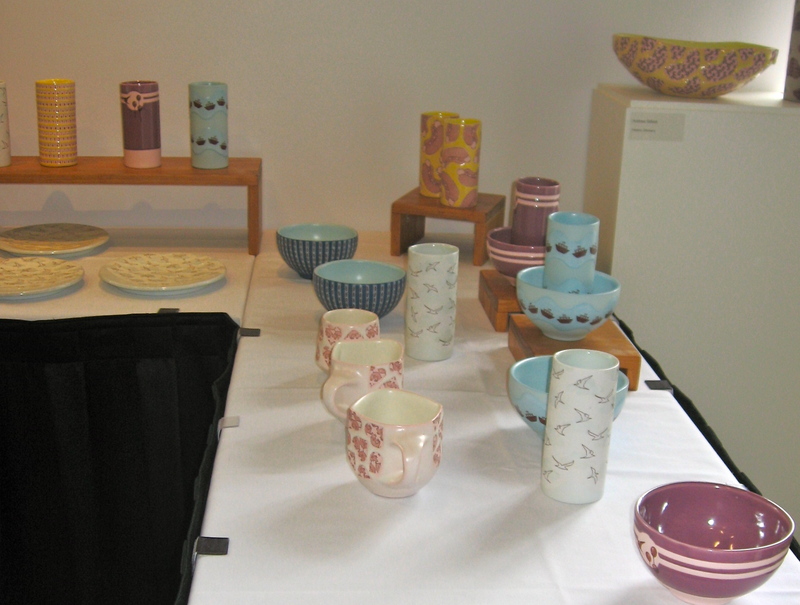 Another view of Liz Lurie’s ware. 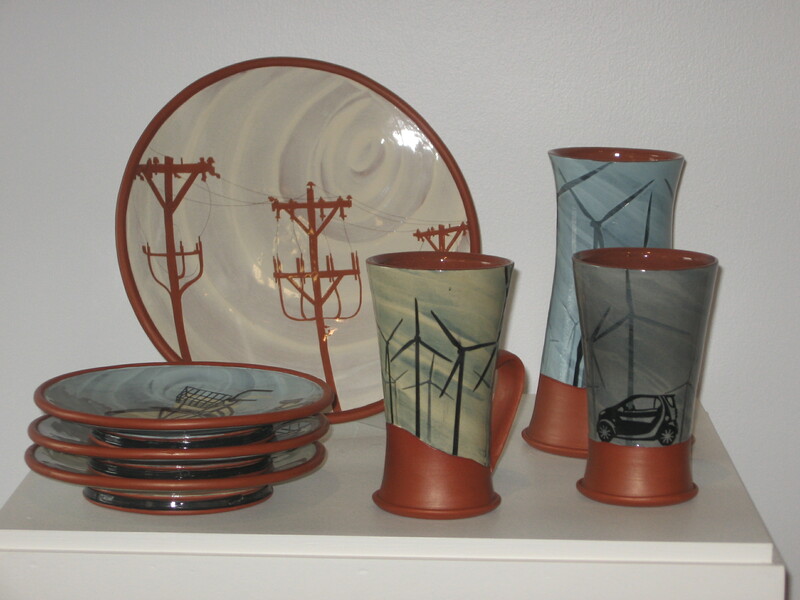 Once a Dallas area potter, now Amy Halko calls California home. 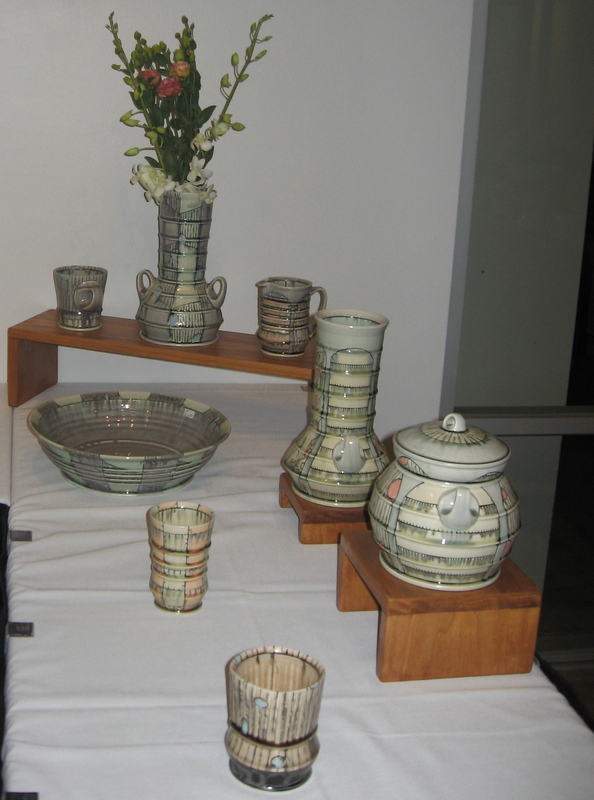 Utilizing porcelain with inlaid slip and glaze decoration, her cone 6 pots exhibit a strong aesthetic vision. During her time as an adjunct and special student at SMU I grew familiar with her work and have several iterations of her ever-changing work in my collection. An overview of the back portion of Halko’s pots. 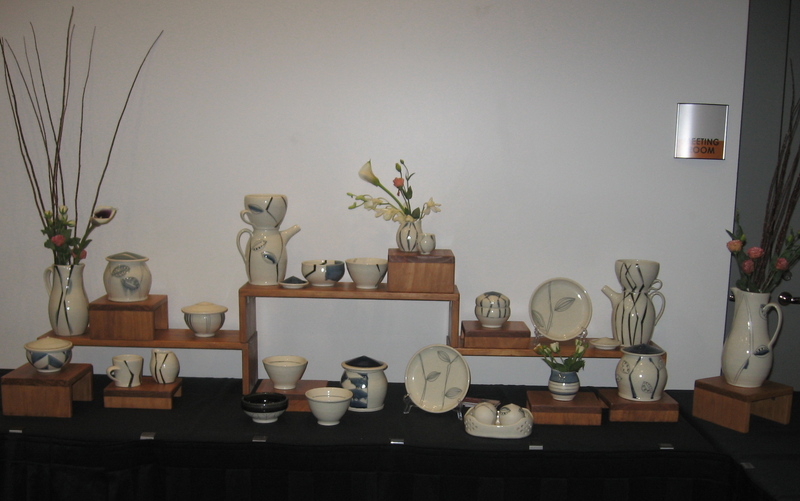 Invitee Doug Peltzman followed up a demo session at the Utilitarian Clay Symposium by hauling a load of his incredible porcelain pots to Dallas. His slow and meticulous process made me feel a little less crestfallen about the drudgery of decorating ware in my own studio. Runny glazes designed to catch on the periodic horizontal ridges punctuated by inlaid black line drawings cover his thin-walled vessels. Meticulous decorations adorn Doug Peltzman’s exacting forms. I buckled and brought a large jar home from his available assortment of pots. It now houses candy and cookies in a place of honor on my dinner table. Following a totally different aesthetic path, Hiroe Hanazono adores simple forms, muted glaze hues, and such mundane objects as cafeteria trays for their compartmentalized function. 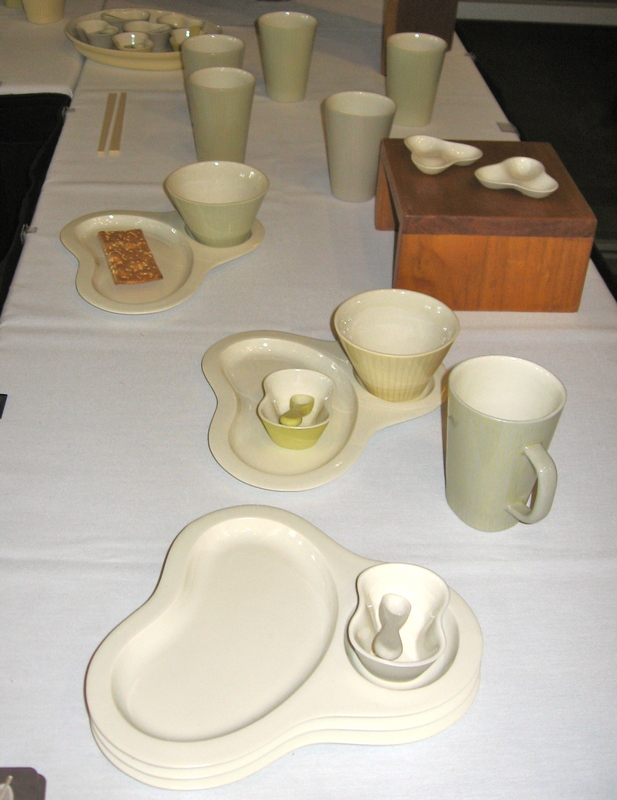 Soft colored porcelain vessels on Hiroe’s table. Nesting smaller vessels in specifically designed indentions is such an ingenious solution. 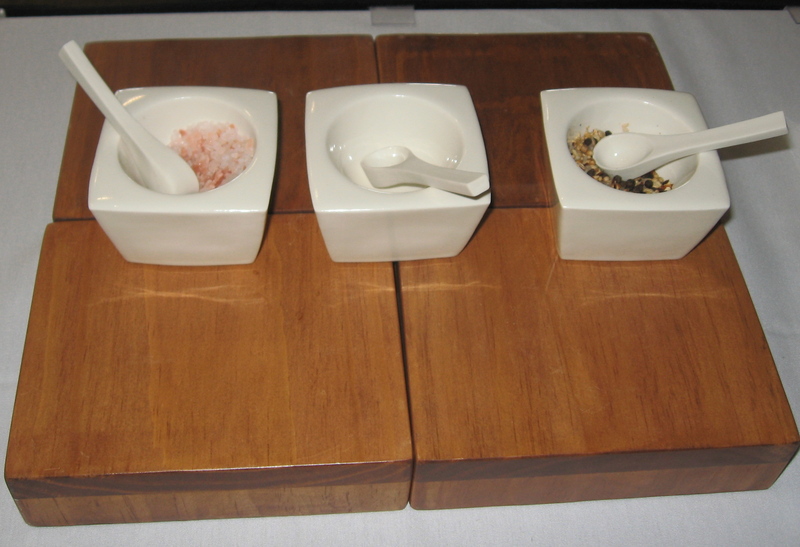 Salt cellars with porcelain spoons. Between thrown forms and hand-built ware small drawings appear on David Eichelberger‘s impressive pots. We celebrated his birthday here in Dallas during the invitational, hopefully staving off the homesickness for his lovely family somewhat. The irregular lobed mugs have the sort of intimate size that keeps them flying off the table. Although I’m perpetually drawn to black pieces so I coveted the following vessels with their delicate hint of color punctuating the differing black surface textures. 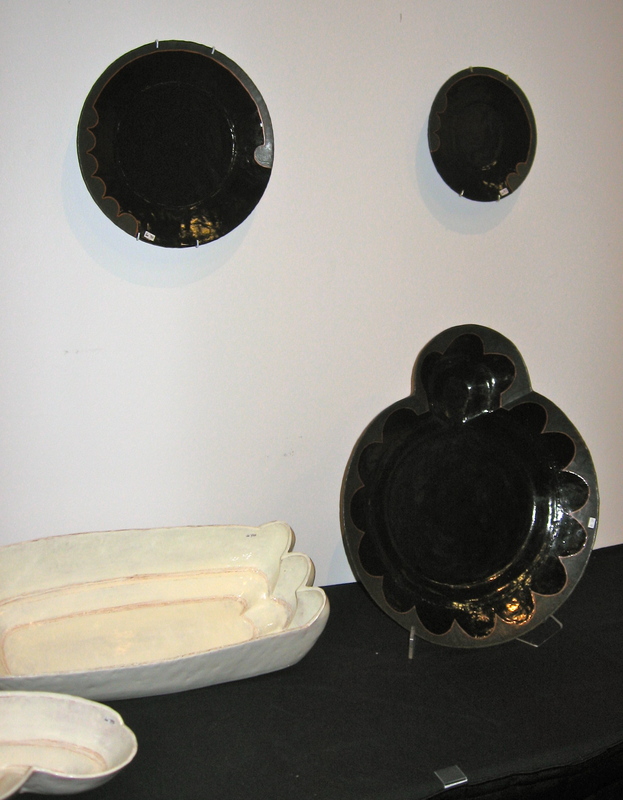 Some of the black ware I loved so much. 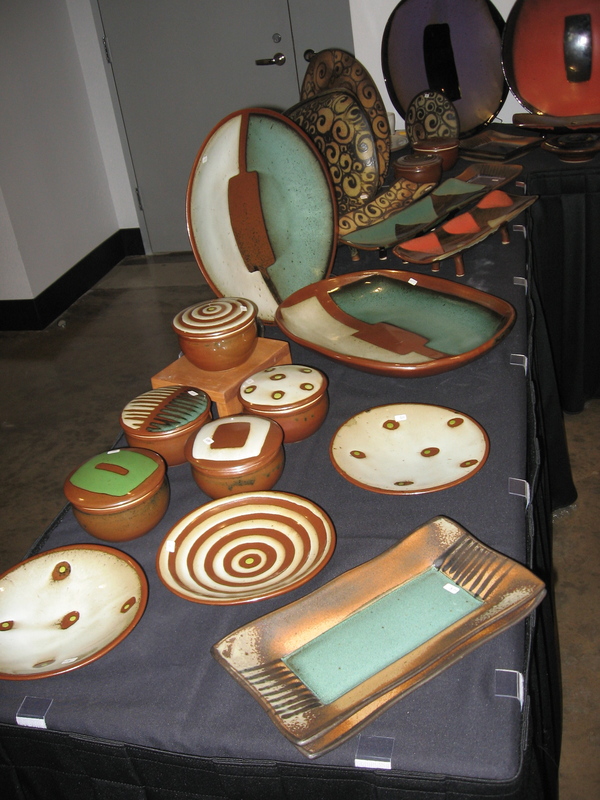 Another recent participant at the UC Symposium, I was happy to see Kip O’Krongly and her concept-rich earthenware vessels. I couldn’t help but snag a bicycle dinner plate and ostrich bowl. Re-visiting the awesome work of Kip O’Krongly. 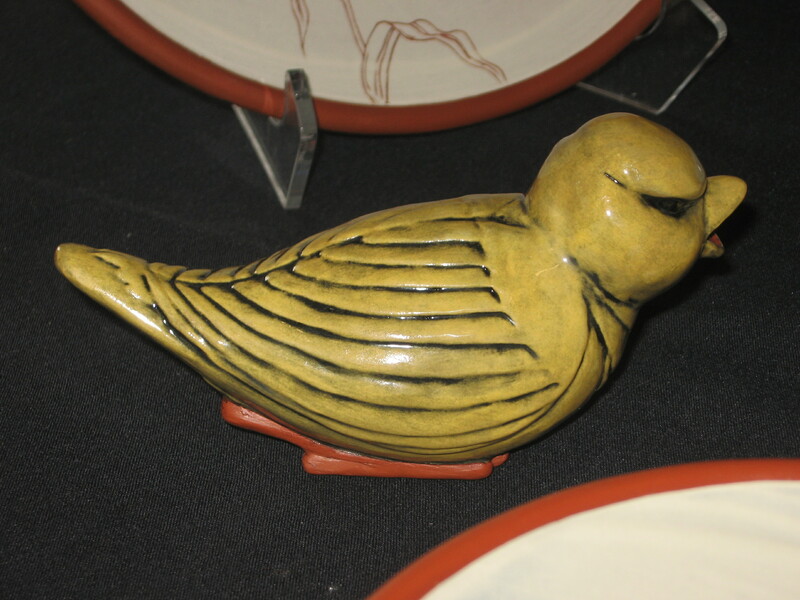 The carved yellow bird salt and pepper shakers are probably the most labor-intensive of her pieces. An angry bird salt or pepper shaker. Driven by the sometimes questionable relationship between large-scale agriculture and nature the pieces exhibit a precarious blend of hope for the future through returning to simpler lifestyles and resistance to such practices as using birds to detect poisonous gases, crop-dusting, and GMO foods. 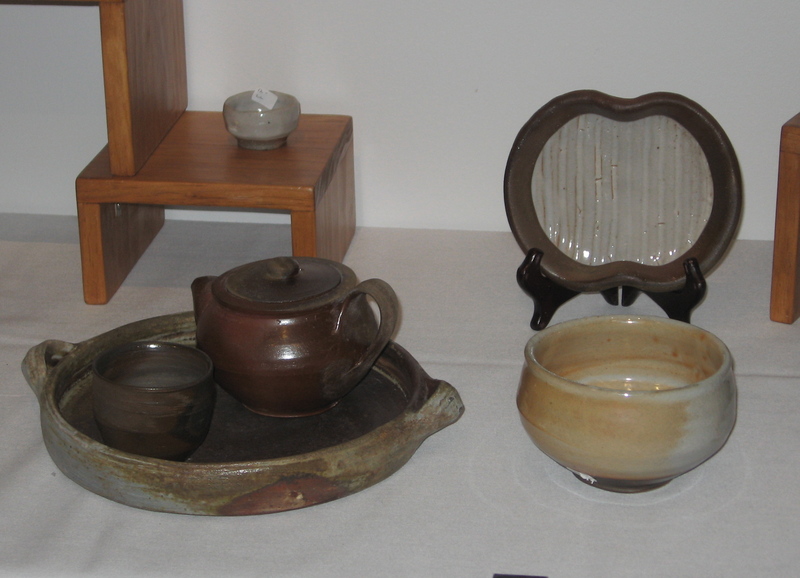 A vignette of plates and cups. The DPI always confronts me with an exciting new assortment of work so I can hardly wait for April to get here already! 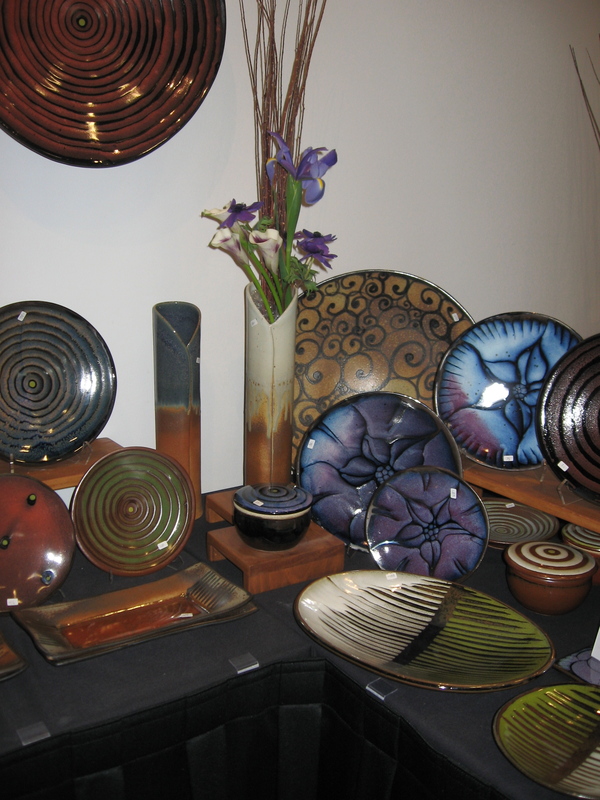 Stay tuned for my next installment, a recap of the Art of the Pot studio tour from last May. 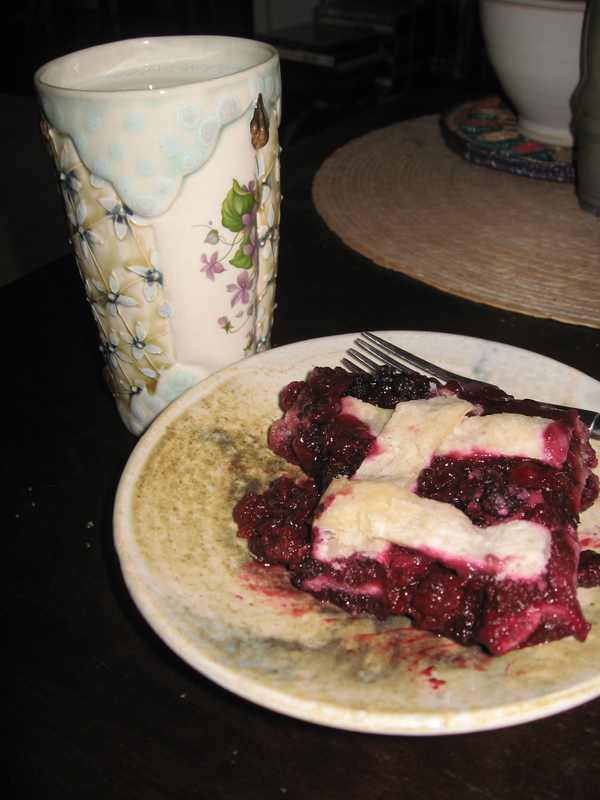 Another spring treasure I’m waiting patiently for, local dewberries picked by my family in a home-made cobbler. Cup by Liz Smith and a small wood-fired plate from my college days.